This is a different kind of mystery chart and in fact it is really more of a puzzle, but a true life one. It requires a bit of background. In 1933 a Dutch astrologer named Leo Knegt (I have no idea how to pronounce that) was given a test by a lawyer friend who also knew astrology. He gave Knegt 10 charts all believed to be well timed, and asked for comments on the lives of the natives focusing on health, career, and unusual personal characteristics. According to the paper I read, he nailed 10 out of 10. By that I don�t mean that every word he wrote was 100% accurate, but that he hit the big stuff and much of it was dead accurate. Here is the sick part. No one knows how he did it. In other words there are no records found of the specific techniques he used to obtain the accuracy. We have to guess, but in one chart, the one we will discuss, it gets worse. Knegt, was troubled by this one chart (remember, he had no information other than gender). He qualified his delineation by noting that he was assuming the time he was given was accurate. Had the birth occurred a few minutes later the �wickedness� might not have developed. From there he went on to describe a man who was in fact a swindler, and con man. He nailed it. OK so what did he see in the natal chart that would tell him that if the birth time was accurate, a) the native was a crook, and b) had he been born a few minutes earlier or later, the terrible things would not have developed? A quick look rules out the most obvious, sign change on the angles. The angles are all mid sign. Planets don�t move significantly in a few minutes of clock time, so that�s out, too. This is the challenge, what did Knegt see to cause him to make such a statement? Here�s the rub: Since he left no notes, there is no way to determine if anyone gets it right. I only ask that we limit ourselves to what we know he used (and we don�t know much) and didn�t use. Early on in his career he used Placidus cusps. Later he changed to Regiomontanus and still later he used Campanus. We don�t know for certain what he used in 1933, when this test was performed. I used Regio. Make sure your comments include the house system used. Use one or use them all, just tell us what you used so we can follow your train of thought. We do know that in 1933 he did not use Pluto. He did use Uranus and Neptune. I suspect after doing two charts in addition to this one, that he used them as co-rulers of Aquarius and Pisces, but I�m not certain. He may have limited himself to traditional rulers. Scorpio belongs to Mars. I strongly suspect if very late degrees were on a house cusp that he used the ruler of the following sign as a co ruler of the house. I also suspect he used very wide orbs 10 degrees or so in many cases. Antiscia plays a role in the other charts I�ve looked at. However that could simply supporting other things. I have no idea if he used antisca or not. I seriously doubt and found no evidence that he used midpoints. Witte�s Rules for Planetary Pictures was published, in German, in 1928, so it is possible. We know for a fact he did not use any hypothetical planets despite being introduced to them early in his studies. If he had, I would have posted this in the General Nativities section. He used fortuna, but I found no evidence that he used any of the other lots. Keep in mind I�ve only seen three charts, so my opinions are based on a minimal amount of data. There is precious little in any of the ten charts that can be called predictive. The purpose of the test was to describe what could be verified � not things that would happen. What did he see that made him speculate that a birth time of �a few minutes� later or earlier for that matter would have changed this life from one of corruption to one much better behaved. Appears it's Leo Knegt, not his son Joost, who did this. Methodology used appears to be in the (admittedly poorly formatted) post. Leo is correct. Too bad about the formatting. I think you meant to write "methodology that appears in the post" not Methodology used appears to be in the (admittedly poorly formatted) post." Where else would it be? 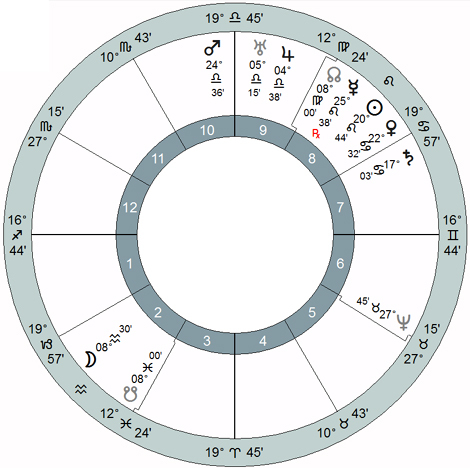 thanks tom and gr for the link with some overview on what the astrologer highlighted.. for anyone who wants to replicate the chart in solar fire - i put in 345pm and the location - utrecht, netherlands.. donald trump has the venus-saturn conjunction in cancer as well.. i was looking at his chart recently.. different chart of course, but thought i would mention this..
i wonder if he used the 45 or 135 aspects which were also commonly used by some in this era? the sun - uranus 45 is fairly prominent.. aside from what was mentioned in gr's link - mercury is also in a fairly tight square with neptune. "Perhaps the best job for her is in the travel industry. With her Part of Fortune in Cancer in 11 trine Venus ruler of 10 and sextile ruler of 6 and the latter also parallel, she will succeed best in the hotel world or in some position on a passenger ship, since her Venus is in Pisces. This was unbelievably spot on! The only job this woman had found after years of searching was the position of stewardess on a passenger ship!" The only significators that will change in meaningful ways in a matter of minutes are the angles or factors relating to the angles such as house cusps, the POF or other parts. If we have no evidence of use of other parts, then it seems he might have advanced his interpretation in the case offered for analysis by Tom on the basis of aspect relationships with Fortune and cusp rulers. The only other factor might be a fixed star on an angle, but I couldn't find anything of relevance. Interestingly if you put the chart case 6 in a wheel, the POF appears in 7 LI 41 and the POS appears in 7 CN 40. It appears that he does not reverse for day and night, which is to follow Ptolemy and use one calculation for Fortune. I can follow the logic for his other significators in case 6 above, but I can't find the ruler of cusp 6 (Saturn in all likelihood) sextile Fortune and it only has a wide sextile to Venus. I will post the pdf file here if I can, of Smit's entire paper. James I'm a little puzzled at your reference to time adjustment. The chart I posted is the one that Solar Fire Calculated based on the time given. I didn't make any adjustments. It is entirely possible that Knegt made some calculation errors, but since I didn't see a chart of his, I wouldn't know if that is accurate or not. The 3:24:30 PM time looks like a rectification, but no mention was made of that. I just used it assuming that Knegt, did as well. Keep in mind we're talking about a difference in clock time of "a few minutes." Planets don't move that fast that they could go from neutral to bad back to neutral in a few minutes. Therefore neither does the POF. The aspects would not vary in a "a few minutes." Admitedly, we have no idea how long that is. I'm guessing 10 minutes or less. But it is just a guess. Is there a way to upload a pdf file somewhere on Skyscript? Yeah I know. I'm technically deficient, but I'd like to make this entire paper available to all. Tom, email the pdf to me and I will upload it to the server and give a link to it here. Hi - is it as simple as issues associated with Neptune on the cusp of the 6th. With Regio, Neptune lies just 30 minutes of arc inside the 6th. This is a factor that would alter with just small differences in time. According to the reference in the link, "He notices that if the birthtime of this subject had been a few minutes earlier, certain very negative character traits would have had lesser chance to develop or probably would have remained dormant forever. According to Knegt, with the birth time given, or just a few minutes later, these negative traits, which all point to serious dishonesty, would have developed." This would imply that with Neptune further into the sixth (earlier in time) the negative characteristics he identifies would not have developed, but with the time given or just a bit later (Neptune on the cusp of the sixth or just out of the sixth), the negative traits manifest themselves. Other changes that occur with a time "a few minutes later" include Venus moving onto the eighth cusp and exactly square the Libra MC, (about nine minutes later) and Mars moving closer to the MC. Knegt suggests that the negative characteristics that this individual displayed were of the nature of fraud and deception, typically associated with Neptune. Perhaps he is alluding to the Fortune's ruler, Mercury, retrograde in the eighth, being square Neptune on the cusp of the sixth and sextile Mars, ruler of the twelfth, a house often associated with hidden things and deceptions. Sorry, I don't buy this. And we have no way of knowing whether any of it is true. Whatever it is, it is probably simple. Based on what I've seen with the other charts, the astrology is not complex. It may be a case of him just being very good with very little. The Neptune idea has some merit as it is on the cusp. So a few minutes before it wasn't and a few minutes later it won't be. I'm a little wary of this idea because it's the 6th house cusp, not an angle. Neptune is square Mercury and the Sun giving credence to the delineation. Also if Neptune is the treachery, it would be better placed on the DSC, and that happened about an hour previous, not a few minutes. you are easily puzzled, lol..
the way my solar fire is set, i need to enter the actual time and the actual place, as opposed to entering long and lat coordinates... like thus below..
if i could do it with the info you gave me i would have, but unless i go in and figure out how to do it by changing the settings i have - that is how i do it.. be puzzled no more! donna chang - i agree with you..
La Volasfera is fairly negative about 16 Sagittarius, describing "an isolated and lonely mind," and "a life of great vicissitudes and hardships," but it seems more like the description of a victim than the instigator. The neighboring degrees are scarcely better. Charubel's description of 16 Sagittarius is reasonably benign, but interestingly the symbolism for 15 is very nasty indeed. "A person entering a dark tunnel: He or she having this degree on the ascendant will go wrong in life. If there be no saving influences in operation. A most unfortunate and hopeless degree this. " If Knegt's calculations gave a different result than our computers for some reason, could this description have been the deciding factor in an otherwise uncertain judgment? Leo Knegt - a White Crow beyond our Wildest Dreams? Here is another copy of the chart in Regiomontanus - the link below will open a much larger image so that its details can be read more clearly.